The cutest baby names that work for your pets aswell. The cutest baby names that work for babies... and the family pet. 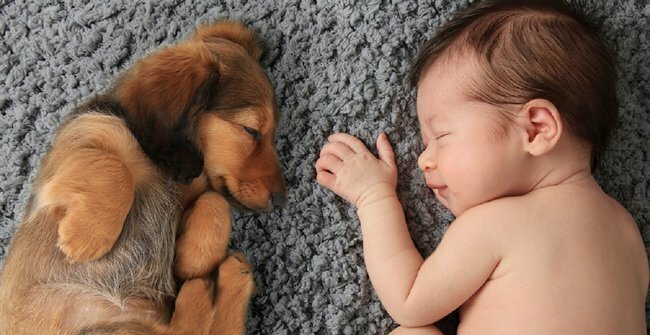 There are some names most sane parents wouldn’t even consider using for their human babies, names like Spot and Fluffy, however it seems that when it comes to names for pets, all human names are up for grabs. Particularly in the case of posh people. Ever noticed how the upper classes always choose the most human of names for their fur babies? And they also treat their fur babies like humans, really turning the rest of us off from following their example? Look, I say this as someone who has posh friends, and as someone who every now and then will kiss my dog Sadie on the mouth. I once begged my cat Millie for a cuddle. I more than anyone completely understands how lines can become blurred when it comes to babies, both animal and human. Still, I blame posh people. Who thinks these pet’s names are something like Prince and Walter? Article continues after this video. Here is a definitive list of a whopping 44 baby names that work for both human babies and pets. Just so you can avoid the typical “Tweetie” for your budgie and “Boo” for your rabbit. Because pets deserve decent names too. The name Milo is arguably the most versatile name on this list seeing as it works for most breeds of pets, is an adorable baby boy name and is also the name given to one of our favourite treats which in my opinion tastes better sprinkled on ice-cream than it does stirred into milk. Not to mention the iconic, epic, hit 1989 movie The Adventures of Milo and Otis, Milo being the tabby cat and Otis being the pug dog. If you’ve ever seen it we INSIST you watch it this weekend. Most gems and jewels work for human babies and pets however Ruby is the least obnoxious of them all. Ruby is a great name for a dog, cat, guinea pig or rabbit. Especially those rabbits with the pink eyes. So darn cute. As human baby and dog names go, Zoe is one of the best. It&apos;s an easy name to say and if you say it with peak excitement in your voice you can just imagine your dog going for a deliriously joyful lap of the back yard. Amy who works in the Mamamia office is a huge fan of Molly for dogs and Billie as well. My cat is called Billie and I’m secretly devo because I love Billie as a name. Our family dog is Molly - which I feel is only a dog name because I know so many dogs called Molly. This just has baby girl and/or bunny written all over it, doesn&apos;t it? You can just imagine a little girl called Daisy wearing a yellow dress or yelling out to a little girl to, "Change Daisy&apos;s water" or "Feed Daisy". In fact Daisy is a great name for any female, both human and pet. Who else thinks of the Queen&apos;s corgies upon hearing this name? Sebastian just seems like such a pure-breed name or it could also be used to improve the social standing of a mutt among dog circles in the neighbourhood. Plus, it&apos;s an adorable name for a baby boy. I&apos;ve never understood why people don&apos;t often give their fish names. We have three Japanese Fighting Fish and even though the names we&apos;ve chosen are completely lame - Reddie, Bluie and Purplo - at least we&apos;ve made an effort. Otto sounds perfect for fish and also for cute little boys who hopefully turn out to be excellent swimmers. Sure, the movie was super-rude and incredibly stupid (stifling amused laughter) but even that movie couldn&apos;t ruin the name Ted for baby boys and dogs. Ted, Teddy, Tedster, Ted X, whatever version of the name you prefer, you can&apos;t go past it for boys and dogs. Or for an incredibly rude and human-like Teddy Bear. While I am a huge fan of boys name Dom and Dominic, I really must had this one over to Mamamia&apos;s Tegan who has the best story to tell about a Dog Formerly Known As...Dominic. My MIL thought she was ‘done’ having kids after 3, so decided she’d used her last favourite name (Dominic) on their new dog. Turns out she wasn’t done…there was surprise 4th ( and 5th)… so the dog got renamed, and her 4th child became Dominic…after the dog. Our budgies are named Archie, BlueBell and Jeb but I really feel we missed out by not calling one of them Gus. It just seems like such a confident name and my budgies are very confident and incredibly loud. Not that your son will turn out to be loud and obnoxious if you choose this name. Probably just quietly confident, as it is a rather strong name. It&apos;s such a shame we aren&apos;t allowed to keep lions as pets. Yes they are enormous, yes they sometimes eat people, but that would be all be worth it just to be able to say, "I have a pet lion named Leo. Leo, the lion." Sadly we are forced to settle for using it on baby boys and cats. This is another perfect name for cats, and dogs, although wouldn&apos;t it be hilarious to use it on a mouse or a bird? Yes I like pet mice. No they don&apos;t smell! Felix is also an ADORABLE name for a baby boy. A little boy in a cute suit with a bow tie springs to mind. Another highly versatile name that can be used for babies, pets and countries. Amy from Mamamia knows a couple of India&apos;s.
My dog&apos;s name is India and I had a high school friend also named India. It sounds as though they have lost touch which is just as well because if human India came over for a dinner party at Amy&apos;s house and dog India stole a piece of chicken from the table prompting Amy to yell, "No India, bad dog!" Well, it might cause offence. My cat is named Millie and I didn&apos;t think much of it until my dad said he wanted me to name my daughter Amelia, for which the most common abbreviation is Millie. I ended up calling my daughter Caterina, however one of her best friends is named Amelia/Millie and I have a friend, a former work colleague called Amelia/Mills. Makes me wish I&apos;d named my cat Fluffy after all. Short for Isabella, Bella also means "beautiful baby girl" in Italian, which makes me wonder why years ago my sister named her male Maltese Terrier Bella, seeing as it&apos;s meant to be for girls only. Bella is a lovely name that suits pets and babies alike. This is a popular name owing to the incredible successful TV show The Big Bang Theory in which Penny is one of the main characters. And Rebecca from Mamamia has a couple of Penny&apos;s in her life. One of my boss&apos; daughter&apos;s names is Coco so I am going to tread carefully here and say that if you have a dog or a cat with brown, chocolaty fur then this is a perfect choice. Or, if you happen to give birth to the most beautiful baby in the whole entire world who is perfect and smart and everything you could hope a daughter to be, then it too is a wonderful, wonderful choice. Especially if she has lovely brown eyes. My dad named his dog Rocco and I&apos;ve always been relieved that none of us girls met and married a man named Rocco because then it could have caused all sorts of ruckus. Rocco is a common Italian name and is the name of one of Madonna&apos;s son&apos;s, because she is Italian as well. In fact my dad&apos;s dog Rocco only understood Italian which is just as well because it forced me to brush up. Bailey is a beautiful baby boy name, a great name for a variety of pets and also a delicious drink on ice with a strawberry mounted on the side of the glass. Bailey is a formal name for a baby boy but seems to conjure images of rather cheeky dogs rifling through the rubbish looking for scraps that may or may not be edible. Thanks to the Australian movie Mad Max there have always been quite a few Max&apos;s given to baby boys and girls (strong of character, able to shave their heads and defend themselves) have been adorned with the equally lovely Max. Then there are those pets that just earn the name, normally German Shepherds wearing bandannas. For some reason Charlie suits cats. It&apos;s just a cat kinda name. It has a feline quality and girl cats can be named Charli, short for Charlise, like my beautiful (human) god daughter lucky enough to also have been given that name. Mamamia&apos;s Ruby had lots of pets with proper names. We had a cat named Millie, a dog named Tommy and currently have a dog named Charlie. It is so true that Molly is a perfect name for dogs but I also like it for any hair pets like bunnies and guinea pigs, because it makes me think "Woolly", except that&apos;s a weird name, so Molly it is. We have a dog named Molly in my extended family and then those of us who are fans of eighties movies like The Breakfast Club are still fond of actress and writer Molly Ringwald, thus passing the super-cute name onto our daughters. Jack is a great name for a dog, especially one that works on a farm. Jack is the kind of dog that would round up sheep for you and rescue you in the heat by fetching water. In Jack you can trust. Then there&apos;s Jackie which allows you to share the name with both male and female babies and pets. Simple names like Cody suit baby boys and girls and this is a unisex one as well as one that suits multiple species like dogs, cats, birds and fish. But imagine a pet snake named Cody. Cody the Cobra. That would be awesome. Not in my house, mind you, but someone else&apos;s. I prefer human babies named Cody and animals that don&apos;t want to eat me or want to eat me, but are physically unable to. Another cute and simple name for a pet or a baby. Sam, Sammie, Sammo, you get where I&apos;m going. Sam is unisex, pet-friendly and easy to fit on one of those little metal things that hangs off the dog or cat collar. Hugh Jackman&apos;s son is named Oscar and it&apos;s also a great name for a pet. Oscar and Ollie are both brilliant baby names as well as pet names. If we were allowed to have ottos as pets we could call it Oscar the Otto. Love a good alliteration. Not just an Aussie name through and through, Mick is also a brilliant name for a pet, particularly at pet mouse. But watch out. Those things breed so easily. Then there are those that choose the name for their babies and pets for lots of other reasons, like Mamamia&apos;s Lize. My dogs at home are called Mick and Keith.....for obvious reasons. L-O-L-A Lola is a great name for a little girl who will probably end up being called "Lols" because that&apos;s what we do with names in Australia, we shorten them as much as possible as often as possible. Not to mention all of the dogs and cats who are also lucky enough to have that name. Roxy Jacenko, PR queen and Aussie celebrity, has one of the catchiest names in the business and probably feels it is a compliment to have Roxy also being used as the name of multiple Australian pets. If she hasn&apos;t come out with a line of pet products yet, watch this space! We have a Jessie in the office and also Jessie is the name of the boy I am hoping Rory ends up with in the upcoming reboot of hit TV show Gilmore Girls. All that aside, Jessie is a really cute name for a baby boy or as a name for a baby girl, a short version of Jessica. Mamamia&apos;s Jessie has heard of quite a few dogs with the same name, which must get confusing for her. As much as I hate to admit it, I know a few dogs called Jessie. My dog is called Cleo. Rosie, a name that makes you smile, no matter how loudly that baby is crying or how loudly that dog is barking. Just for our precious little girls, Rosie is a sweet name for any little creature, human or otherwise, we love and adore. Edwards seems to be such a serious name, although it&apos;s female counterpart Edwina is pretty special. Then there&apos;s the shorter version of the name, Eddie, which suddenly suits everyone from baby boy to baby girl to dog to cat to cockatoo. Mamamia&apos;s Eddie is quite happy to know her name is also one bestowed on beloved pets. Jackie&apos;s dog is called Eddie, which I quite like. Also my friend used to have a dog called Gemma. So not a dog name. This disabled dog&apos;s name is Daisy and it just suits this little sweetie all the way down to her new little legs. Article continues after this video. I love dogs named Sophie. I think it sounds great and looks absolutely smashing on collars and food bowls. Then you have the name being used on human babies which is just as wonderful. I&apos;ve never met a Sophie I didn&apos;t like, from pet to human. Grace is such a lovely name for a baby girl and Gracie is a lovely and fun name for a little puppy you hope and pray has the good grace to WEE OUTSIDE NOT ON THE RUG. I love the name Jasper for baby boys. It reminds me of those cheeky types with a twinkle always in their eye and some sort of caper constantly in mind. It&apos;s also a great name for a male dog or a cat. Cats can be really cheeky. I often wonder if cats are smarter than humans and just feel sorry for us. Dogs named Jasmine seem to be such sweethearts. It&apos;s no wonder this is also a popular name for baby girls. I think the name Jasmine suits any pet but especially female cats who just love to stretch out on the lounge for a cuddle. Harley, another bandanna-wearing dog who will defend you before you even know you are in danger, who take on any adversity and let&apos;s just say it, probably deserves his own reality show. Then there are baby boys named Harley who if they know what&apos;s good for them will grow up to love Harley Davidson bikes just like their dads and quickly learn how to ride them. Lucy is a really great name for a dog or cat. It just seems like a fun name and it&apos;s super-sweet for baby girls. It&apos;s not very popular on baby name lists anymore but is one of those classics that will always be around. Once again Mamamia&apos;s Valentine is reminded of all of the pets in her family with human names. My sister&apos;s dog is called Lucy. And my other sister&apos;s dog is Marley. Chester isn&apos;t a popular choice for pets or human babies but it should be. Let&apos;s BRING BACK THE CHESTERS. Think of a gorgeous dog with a lovely chestnut sheen to their coats or a little vest-wearing baby boy named Chester. It&apos;s just too adorable for words. I remember celebrity vet Dr. Katrina Warren had a beautiful dog named Toby. I watched him sit next to her on TV from puppy to older dog and then he passed away. I cried like a baby. Toby is also a popular name for baby boys and you can pretty much find at least one Toby in every single Aussie TV show. Am I wrong? Not just the name of strong and handsome The Bachelorette contestant and ultimate winner from Sam Frost&apos;s season (is it any wonder that he captured our Sam&apos;s heart?) Sasha is also a really cute name for pets. It just sounds comforting, hug-able, everything babies and pets should be. My son Philip named our dog Sadie and he can&apos;t remember where he got the name from. It&apos;s such a cute name for her. I can&apos;t imagine her being called anything else. Of course that has ruined the name for me forever for human children, however I know it&apos;s one of the older-style names making a bit of a comeback so watch this space. This isn&apos;t a name you&apos;d chose for an attack dog. It suits the kind of dogs who are happy to be held, walk as little as possible and roll on their backs so you can better access their tummies for scratches. It&apos;s also one of the sweetest baby girls names of all time with most Chloe&apos;s I know through my daughter Caterina being the shy types. Kiki is a nickname for girls named Catherine and it&apos;s also a great name for pets because it is short, cute and not very common. You could name any pet Kiki but for some reason I keep picturing one of those rude birds that talks back and drops the occasional swear.